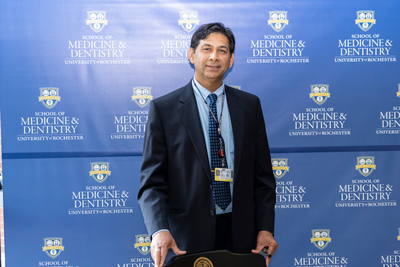 Irfan Rahman, Ph.D., professor of environmental medicine, public health sciences, dentistry and medicine has been designated as an American Thoracic Society Fellow for his pulmonary science accomplishments and services to international lung community. Dr. Rahman's lab is interested in understanding the redox signaling, mechanism of proinflammatory gene expression by studying the chromatin remodeling-epigenetic changes (histone acetylation/deacetylation) on pro-inflammatory genes, involvement of anti-inflammatory and anti-aging proteins sirtuins, and steroid resistance in chronic inflammatory diseases/COPD. Recent research includes in understanding the role of sirtuins in aging and accelerated decline in lung function and regulation of circadian genes. Our long-term goal is to understand the cellular and molecular mechanisms involved in pathogenesis of COPD, and the potential benefit of therapeutic interventions in this debilitating disease. Why does preterm birth increase the severity of respiratory viral infections in children? Michael O’Reilly, Ph.D., professor of Pediatrics and Environmental Medicine has received a $2 million grant to investigate how early exposure to oxygen changes how the lung responds to influenza A virus later in life. The grant continues a line of research that began 12 years ago when his own son Thomas was born preterm. A growing body of evidence suggests exposure to environmental pollutants during critical stages of fetal and postnatal lung development can permanently change health of the lung later in life. The transition to air at birth is one of the most profound environmental changes that the developing lung will ever experience. While the newborn lung is prepared to breathe oxygen, the preterm lung transitions too soon. This aberrant exposure to oxygen at birth can increase the severity of viral infections through poorly understood mechanisms. Using a novel mouse model, Dr. O’Reilly and his colleagues discovered high levels of oxygen at birth increases the severity of influenza A virus infection by depleting epithelial stem cells needed to repair the infected lung. The goal of the new grant is to figure how oxygen depleted these cells with the hope that such knowledge will increase our ability to prevent or treat lung disease in people born preterm. Additional collaborators on this project include B. Paige Lawrence, Ph.D., Luis Martinez-Sobrido, Ph.D., Andrew McDavid, Ph.D., and Martha Susiarjo, Ph.D. The expertise of two regional research teams has earned a federal grant of nearly $20 million to create the nation’s first program dedicated to the study of flavored tobacco. One of only nine projects to earn funding through the federal Tobacco Centers of Regulatory Science (TCORS) program, the WNY Center for Research on Flavored Tobacco Products, or CRoFT, will unite teams from Roswell Park Comprehensive Cancer Center and the University of Rochester Medical Center in an effort to better document and understand one of the fastest-growing trends in tobacco use. At Opening Convocation on September 6, 2018, Paige Lawrence received the award for Outstanding T32 Program Director. This award is presented to the T32 principal investigator with the best impact score for a new grant or competing renewal in the past year. Irfan Rahman was also recognized at Convocation for receiving a Dean’s Professorship this past year. Dean’s Professorships were established in 1982 and are designated by the Dean to be assigned to individuals of outstanding research excellence. 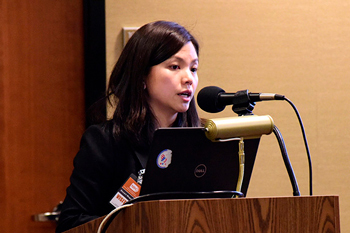 Recently featured as an NIEHS Success Story, NIEHS grantee Martha Susiarjo, Ph.D., studies how exposure to endocrine disrupting chemicals (EDCs) may negatively affect the health of a pregnant mother and her baby. EDCs are chemicals that can interfere with how hormones in the body communicate. Bisphenol A (BPA), flame retardants, and other contaminants that may act as EDCs are found in everyday consumer products, such as plastic bottles, metal food cans, and household furniture. As a graduate student at Case Western Reserve University, Susiarjo performed genetics research to determine the effects of BPA on oocyte development in mice. This research was conducted under the mentorship of Patricia Hunt, Ph.D., a geneticist who discovered chromosomal abnormalities in the offspring of pregnant mice inadvertently exposed to BPA from damaged caging materials. After successful completion of her doctoral research in 2007, Susiarjo went on to receive postdoctoral training under the direction of Marisa Bartolomei, Ph.D., an epigenetics researcher at the University of Pennsylvania. While there, Susiarjo received an NIEHS postdoctoral training grant to study the impact of BPA exposure on the mouse epigenome. 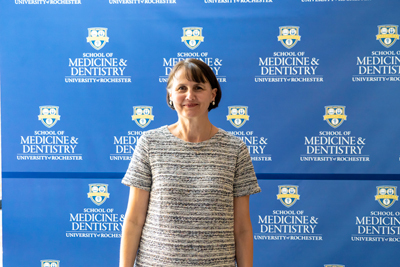 Susiarjo now leads research in her own laboratory at the University of Rochester School of Medicine and Dentistry. 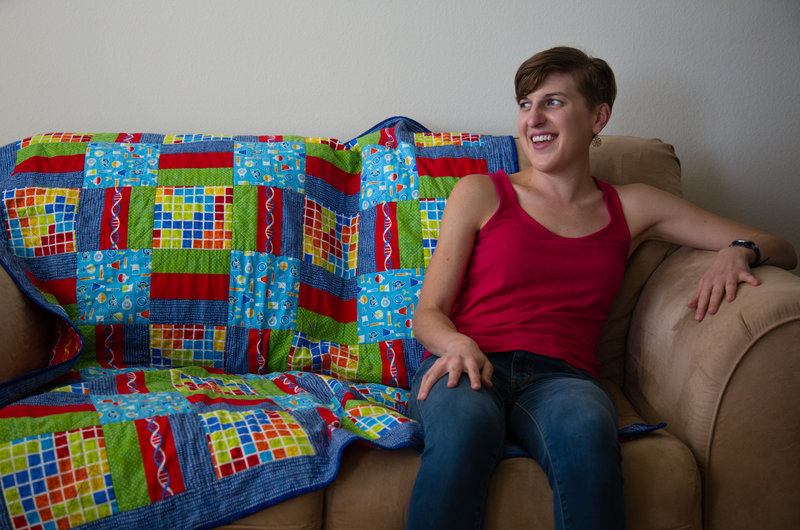 Her lab uses mice as a model organism to explore the molecular mechanisms that regulate the effects of EDCs on maternal health and fetal development during pregnancy. Her research shows that epigenetics, or heritable changes that affect gene expression without changing the genetic sequence in DNA, can play a large role in these effects. Lawrence Lab article chosen as one of the NIEHS “Papers of the month"
The Lawrence Lab's article, "Developmental Exposure to a Mixture of 23 Chemicals Associated With Unconventional Oil and Gas Operations Alters the Immune System of Mice", has been chose as one of NIEHS "Papers of the month." The paper deals with prenatal exposure to chemicals used in unconventional oil and gas (UOG) extraction, also known as fracking, affected immune system development in mice, according to a new study by NIEHS grantees. The study provided the first evidence that early-life exposure to a mixture of 23 commonly used UOG chemicals may hinder the ability to ward off diseases later in life. Congratulations to the entire lab, Dr. Lawrence and co-authors, including Drs. Steve Georas, Jacques Robert and Susan Nagel (Missouri). Read More: Lawrence Lab article chosen as one of the NIEHS “Papers of the month"
Vapes may be the lesser of two evils, but that doesn’t mean that they aren’t, well, evil. Conventional cigarettes sent a generation of smokers hacking and coughing right to their deaths. By comparison, vape pens are far less dangerous. But that doesn’t mean e-cigarettes — the Juuls and KandyPens teens seem to love so much — are safe for children (or their parents). Studies suggest that children who vape are more likely to smoke real cigarettes later on, setting back decades of anti-smoking efforts. The liquid and vapor that vape users inhale (and exhale onto others) contain harmful chemicals such as anti-freeze, a host of carcinogens, and other substances known to cause cell death. Meanwhile, the concentrated nicotine in vaping solutions poses a unique, toxic threat to small children who unintentionally swallow the liquid or spill it on their skin. In a word, e-cigarettes aren’t safe for your kids and aren’t safe around your kids. Amid predictions of a second fracking boom in the U.S., the first evidence that chemicals found in ground water near fracking sites can impair the immune system was published today in Toxicological Sciences. The study, performed in mice, suggests that exposure to fracking chemicals during pregnancy may diminish female offspring's ability to fend off diseases, like multiple sclerosis. But it’s increasingly clear that the effects of air pollution aren’t constrained to body parts below the shoulders—they can hurt the brain in a whole host of ways, many of which researchers are still trying to understand. One major area of interest? The way exposure to polluted air can affect the cognitive development of babies and children. Researchers aren’t shocked to find that an environmental toxin could harm young brains, because they’ve seen it happen before. Imprinted genes and how their interactions with environmental chemicals can affect maternal and fetal health was the focus of a talk by Martha Susiarjo, Ph.D., from the University of Rochester. She spoke March 21 as part of the NIEHS Keystone Science Lecture Seminar Series. Imprinted genes are those in which the copy from one parent is silenced through epigenetic modifications, which are changes to DNA that affect the function of genes but not the underlying DNA sequence. Think electronic cigarettes without nicotine are harmless? Think again. 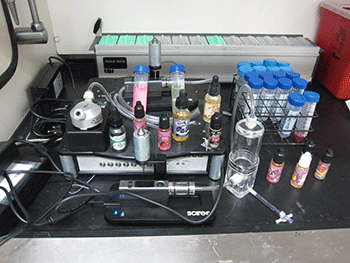 A new study shows that the flavorings in e-cigs can harm human infection-fighting cells. The nicotine may be useful for adults who are addicted to cigarettes and want to wean themselves off. But nicotine can harm children and teens. That’s why some young people may choose to vape instead of smoke, and use nicotine-free products. But the new data suggest that e-cigs can still be toxic, even without nicotine. “We know these flavors are really attractive to teens,” says Irfan Rahman. He works at the University of Rochester in New York. He says studies have shown that one reason many teens try e-cigarettes is an interest in fruity and candy-flavored products. Rahman’s team didn’t expose people to these flavorings, in case they were harmful. Instead, they tested e-liquid chemicals on human cells in a dish. This helped them judge whether the chemicals might also harm cells inside the body. The answer: Some of the vaped flavorings did prove toxic to those cells. The researchers published their findings in the January Frontiers in Physiology. On March 21st at the Thomas P Ryan R-Center, 530 Webster Avenue in Rochester, NY, Dr. Irfan Rahman participated in the Kick Butts Day Point of Sale & Tobacco 21 Forum. The event was organized to address tobacco’s impact on youth & the community as well as research and evidence-based policy solutions. 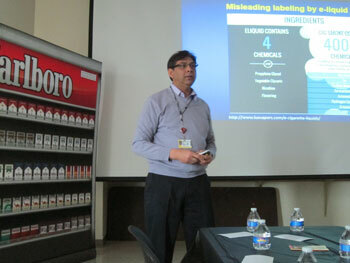 Dr. Rahman's talk was on Local Youth Impact & E-cigarette Usage. Rahman To Be Featured Guest on European Science TV Series "Xenius"
On Monday March 26th, Dr. Irfan Rahman will be the featured guest on the renowned European TV science series ARTE's Xenius (Science Made Easy). This episode of the series features e-cigarette fluids and about the latest research about their possible health risks. As a result of Dr. Rahman's scientific insights and ongoing studies about chemicals in e-cigarette flavours and possible health issues that are caused by them, the show's director, Nils Otte, reached out to Irfan to be on the show to discuss his research and the effects of e-cigarettes. More than three decades of research in the Seychelles have consistently shown that high levels of fish consumption by pregnant mothers do not produce developmental problems in their children. The international team of researchers behind this study, one of the largest and longest population studies of its kind, is meeting this week in Rochester. The Seychelles Child Development Study has transformed scientists’ understanding of the relationship between the consumption of fish rich in nutrients necessary for brain development and the possible harmful effects of mercury also found in fish. The study’s findings have global implications – fish represent the main source of protein for much of the world’s population – and challenge the long-promulgated advice of many organizations that expecting mothers moderate fish consumption during pregnancy. “This study is a truly international and interdisciplinary collaboration that demonstrates how the combination of rigorous science and a commitment to taking the long view can help us answer important questions related to health, diet, and child development,” said Edwin van Wijngaarden, Ph.D., a professor in the University of Rochester Medical Center’s (URMC) Department of Public Health Sciences who leads the Seychelles Child Development Study. The Seychelles, a cluster of islands in the Indian Ocean, has proven to be the ideal location to examine the potential health impact of persistent low-level mercury exposure. The nation’s 90,000 residents consume a wide variety of ocean fish at a rate 10 times greater than the populations of the U.S. and Europe. The island nation also possesses universal and free health care and education and is largely free of the industrial development that could serve as a source of pollution. One rarely is lucky enough to drive the early evolution of a new scientific discipline, but Bernard (Bernie) Weiss was there, always at the forefront as the field of behavioral toxicology took shape. And along with the many students he inspired, he remained there throughout his career. Blending psychology, toxicology, and technology, Bernie Weiss shaped this discipline using new methods to explore the subtle, and not so subtle, effects of environmental chemicals on behavior and the nervous system. He was a remarkable scientist, thinker, visionary, and writer. Bernie Weiss passed away on the morning of January 22, 2018. Bernie was born in Brooklyn, NY, in 1925 and served in the Air Force from 1944-45. 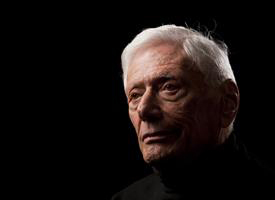 He earned a Bachelor of Arts degree in Psychology from New York University in 1949, and a Ph.D. in Experimental Psychology in 1953 from the University of Rochester. From Rochester, he took a job at Johns Hopkins School of Medicine, but was recruited back to University of Rochester in 1965 by Dr. Harold Hodge to explore the behavioral consequences of exposure to toxicants, such as inorganic mercury vapor. Bernie was a pioneer. In the 1960s he was one of the first to use LINC (Laboratory Instrument Computer) and Digital Equipment Computer (DEC). Computer systems would later allow researchers to perform incredibly complex experiments and collect data at a level of detail never before imagined, thereby revealing subtle effects of chemicals on behavior. Bernie's lab led the way in computer-controlled experiments in behavioral toxicology, as well as to assess the effects of low levels of drugs and metals on the sensory systems of vision, touch and hearing. Many of these testing capabilities were transferred to and shared with other research laboratories. Bernie also addressed the investigation of rare, idiosyncratic toxicity, such as food additives and multiple chemical sensitivity. By their nature, these investigations require less traditional study designs in which the subjects are not randomly assigned to the exposure group (most people would never respond), but the exposures are randomly applied in a blinded fashion to people believed to have the conditions. Bernie was a master of technical details, but he also kept his eye on the big picture. Just one example: he pioneered the idea that small decreases in the average IQ of a population could lead to big decreases in intellectual stars, and big increases in people with individual cognitive disabilities. Population level effects have consequences. As the science of behavioral toxicology and related research methods evolved, Bernie continued to champion the scientific facts demonstrating that low levels of exposure to chemicals could have profound effects on the developing nervous system. He encouraged others to take on this work, pursuing for him what became a lifelong goal: to make the world a safer, more resilient place for all. Bernie was a generous and enduring collaborator. One notable example is his long-term collaboration with Victor Laties (Ph.D. Psychology University of Rochester, '54). Together they shepherded the discipline of behavioral toxicology from its origins in behavioral pharmacology to its distinguished and impactful status today. Bernie was also a great mentor, who created a unique atmosphere of stability with flexibility that gave his students, staff and collaborators support and encouraged creativity necessary for good science and to explore new ways to answer research questions. He always made himself available to students and staff to discuss problems and scientific challenges, and to explore new methods to try to answer questions. Bernie wasn't satisfied to remain quietly within the cloistered halls of academia. He saw the human implications of his work and while always the scientist, he pushed hard to apply that science to protect human and environmental health. Many of Bernie's students went on to have important and impactful careers in academia, government and industry. The family encourages gifts of remembrance be donated to the University of Rochester Weiss Endowment Fund, supporting the Weiss Toxicology Scholar Award for pre-doctoral and postdoctoral trainees. The Fund has supported 8 scholars since 2014. Pete Myers, Environmental Health Sciences; Richard W. Stahlhut, University of Missouri at Columbia; Joan Cranmer, University of Arkansas for Medical Sciences; Steven G. Gilbert, Institute of Neurotoxicology & Neurological Disorders; Shanna H. Swan, Icahn School of Medicine at Mount Sinai. Bernard “Bernie” Weiss, ’53 (Ph.D.), professor emeritus of Environmental Medicine and Developmental & Behavioral Pediatrics, passed away on January 22 at the age of 92 as the result of a fall. Weiss was a monumental and beloved figure in the scientific community, and helped found a field of research that tracks the impact of toxic chemicals on human behavior. His research sparked national discussions about the dangers of artificial food dyes, pesticides, and chemicals in plastics. He often advocated for better policies to protect the public. As recently as 2015, Weiss participated in a national debate over the safety of food dyes, which the Food and Drug Administration had declared safe. Citing studies that showed an association between children ingesting food dyes and hyperactivity, Weiss supported a ban. Several large manufacturers, including Kraft, announced they would remove artificial food coloring such as Yellow No. 5 and Yellow No. 6 from its macaroni and cheese, replacing the dyes with natural ingredients such as turmeric and paprika. Into the final years of his career, Weiss sat on advisory boards that review data and make recommendations about dioxin (an industrial waste product), metals, dental amalgams, the environmental conditions on NASA spacecraft, and air quality aboard commercial airplanes. Up to about two years ago, he could be found in lab several days a week, happy to offer consultation and support to other researchers. A scientific paper he co-authored is in the process of being published. Another colleague was fellow environmental health pioneer David Ozonoff, M.D., M.P.H., chair emeritus of environmental health at Boston University School of Public Health and co-editor-in-chief of the online journal, Environmental Health. He admired Weiss for his steadfastness, persistence to shared ideals, willingness to put his expertise at the service of the common good, his good humor, and not least, his major contributions to science. “His legacy will not only be the scientific advances he made but those that will be made by others inspired and mentored by him,” Ozonoff said. Weiss’ career began and ended at the University of Rochester. He earned a doctoral degree in Psychology at the University in 1953 and returned 12 years later as a faculty member. In the intervening years, Weiss, a WWII Air Force veteran, conducted research at the Air Force School of Aviation Medicine in Texas, then Johns Hopkins University. He began developing ways to measure the impact of drugs, nutrients and chemicals on the brain, and built one of the first mini-computers ever used in research. In 1965, Weiss was lured back to URMC as it launched one of the world’s first programs to grant a doctoral degree in toxicology. His research and mentorship helped build the program, which recently established the Bernard Weiss Endowment Fund in honor of his indelible mark on the program. The fund, which was organized by a group of URMC Toxicology Graduate Program alumni and staff, provides support for future leaders in the fields of neurotoxicology and toxicology. Weiss received several honors. He was named Scientist of the Year by the Association of Children and Adults with Learning Disabilities in 1986. In 2003 he received a Distinguished Investigator Award from the Neurotoxicology Specialty Section of the Society of Toxicology. During the mid-1970s, Weiss took part in the U.S.-U.S.S.R. Environmental Health Exchange Agreement, where he led several U.S. delegations in discussions of behavioral toxicology with their counterparts across the globe. Weiss is survived by his children, Wendy (Les) Calkins and Tom (Debora) Weiss; grandchildren, Zachary (Sara), Nicole, William, Emily (Marcelo); brother, Leonard (Sandra); beloved partner, Marti Willit; nieces and nephews. A memorial service will be held at a later date. To honor Weiss, consider making a contribution to the Bernard Weiss Endowment Fund. Dr. Thivanka Muthumalage, a Toxicology Postdoc in the Rahman lab, has been selected for an oral/podium presentation for his abstract, "Cellular Toxicity and Reactive Oxygen Species Prodution by Commonly Used Flavoring Agents in E-Cigarette Liquids", at the 2018 Meeting of the Society for Research on Nicotine and Tobacco (SRNT). The Annual Meeting will be held February 21-24, 2018, at the Hilton Baltimore Hotel in Baltimore, Maryland. Dr. Muthumalage's abstract, "Immuno-Toxicological Response in Monocytes to E-Cigarette Flavor Chemicals and E-Liquids" has also been selected as a Platform Presentation during the 57th Annual Meeting of the Society of Toxicology (SOT), March 11–15, 2018 at the Henry B. Gonzalez Convention Center in San Antonio, Texas. Rahman lab undergrad, Melanie Prinz's poster abstract submission, "Reactive Oxygen Species Production by Commonly Used Flavoring Agents in E-Cigarette Liquids " was selected for presentation at NCUR 2018 at the University of Central Oklahoma. Chosen from more than 4,000 submissions, her abstract demonstrates a unique contribution to her field of study, and NCUR was glad to offer her the opportunity to present this work to her peers, faculty, and staff from all over the nation.